SKU: 1008/NQ Category: "Frontier" Revolvers - 7.5"
Smith & Wesson had pioneered the development of metallic cartridges for pistols and were ready to manufacture something really revolutionary, the first cartridge revolver. 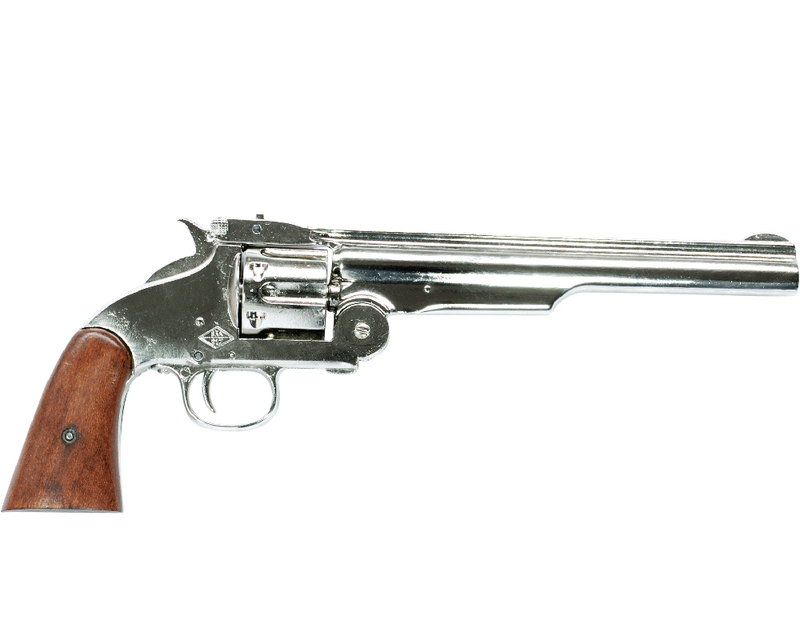 When Colt's original patent covering the revolving cylinder expired in 1857, Smith & Wesson had purchased the Rollin White patent for boring the cylinder all the way through so that a cartridge could be inserted in the back. White offered this method to Colt, but Colt, not thinking in terms of metallic cartridges, had turned it down. Consequently Smith & Wesson had a monopoly on cartridge revolvers. 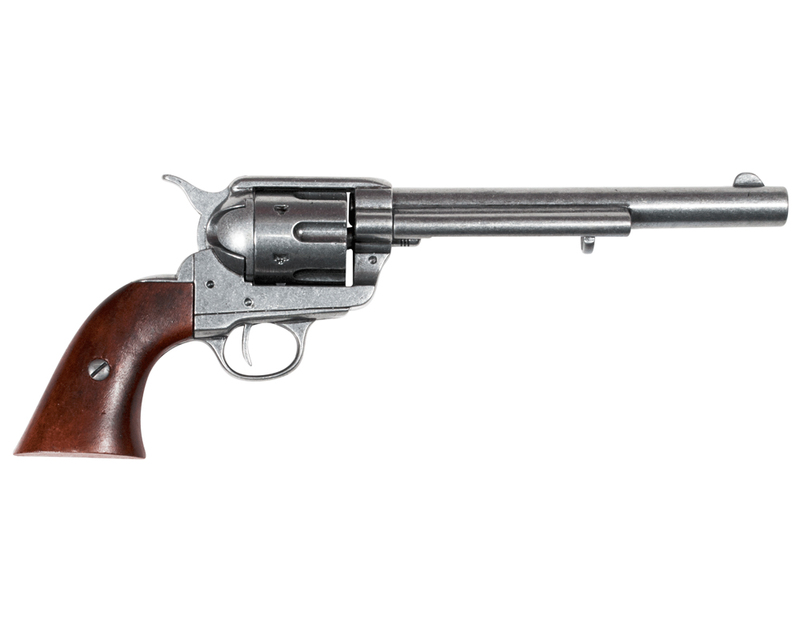 They began with a seven-shot .22, added a .32 and .44, many of which were carried as sidearms by Civil War soldiers. Buffalo Bill owned a Smith & Wesson .44; so did Texas Jack Omohundro, associate of Bill's in the Wild West Show. 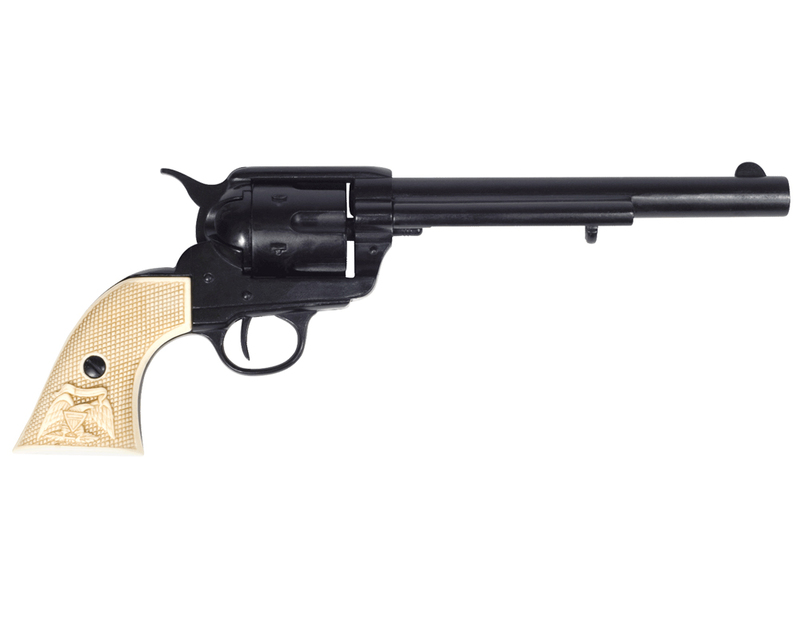 This non-firing replica of single action .45 caliber revolver features an 8'' barrel and unique break-open action for easy reloading. Shiny Nickel Finish, Overall length: 13"; Weight: 2.9 lbs.